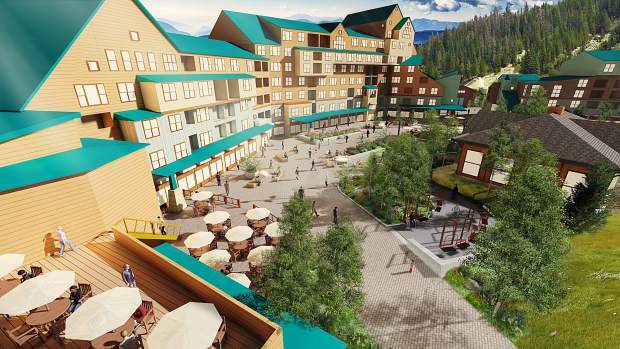 An artist rendering of what the plaza area in front of Zephyr Mountain Lodge will look like on completion of the improvement project. WINTER PARK — Tourists and ski enthusiasts will barely recognize Winter Park Resort come this winter thanks to several large-scale improvement projects across the resort. The projects, which constitute the single biggest improvement the resort has done in its history, include a new 10-person ski gondola, an updated snowmaking system and several acres of logging. All those projects are presently on schedule to open for the 2018-2019 winter season. According to Steve Hurlbert, director of public relations for the resort, the resort received $28.2 million for the project from its parent company, Alterra, which is more than any other Alterra-owned resort has received for improvements this year. The ski gondola will replace the Zephyr Express chairlift, a high-speed lift that was capable of carrying four passengers, which had been operational for almost three decades. Hurlbert said the gondola, which will run from the main resort base to the Lodge at Sunspot, will improve the guest experience by getting them up the mountain more quickly and comfortably than before. The gondola is expected to increase upload capacity to 3,600 guests per hour and will decrease wait time by 15 minutes during peak season. “It’s going to really enhance access to skiing, which, when you come to Winter Park, you don’t want to sit in a line, you want to get up and start skiing,” Hurlbert acknowledged. The gondola, a Leitner-Poma model, is projected to cost $16 million. It has yet to be named. The resort will also be replacing its 42-year-old snowmaking system in an effort to open more terrain earlier in the season. The project, which will cost $4 million, required replacing old pipes, as well as adding new, high-tech snowmaking guns. The terrain will also see changes in tree coverage since the resort is logging 21 acres in its Eagle Wind territory. Hurlbert said that the logging is mainly to maintain forest health and remove trees that were affected by the pine beetle infestation, but will open up the area and improve glade skiing. It will cost the resort less than $1 million to complete the logging. “From a great new lift to snowmaking, which is going to continue to improve our snow surface, to glade skiing at Eagle Wind, it’s all aimed at making the experience to Winter Park Resort as great as it can be,” Hurlbert said. Not only will the resort see significant changes, but so will the plaza area in front of the Zephyr Mountain Lodge. The $1.75 million improvement project, orchestrated by the Winter Park Village Company Master Association, will open up the space for events, including the addition of a stage area and a fire pit, as well as the installation of a snow melt system under the walkways. The project is expected to be completed in early November. “What this will do is open things up, make it a lot easier for people to pass through there, as well as create some public gathering spots,” Hurlbert said.